If you are new to the area, have come back to Sierra Vista, or have decided to build a new custom home; come talk to us here at Isaacson Homes to understand what all your possibilities and options are. We would enjoy helping you into your dream custom home. There are many options for builders in Sierra Vista, Huachuca City, Whetstone, Hereford, and Bisbee, AZ, but we would like to be your first option for the construction of your new house. We at Isaacson Homes, feel we are the best choice as a General Contractor for your new dream home. 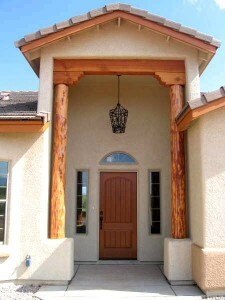 Isaacson Homes, LLC specializes in custom, energy efficient homes in Sierra Vista and surrounding areas. We have developed a reputation for custom homes with beauty, quality, and value. Our homes reflect structural integrity and an unsurpassed quality of craftsmanship. We focus on complete customer satisfaction, building a home that meets the dreams and wishes of our clients. We are a proud partner with EPA’s Energy STAR program. If you are looking to start “going green,” an energy-efficient home from Isaacson Homes is a great place to begin. Our ENERGY STAR qualified homes are independently inspected and certified to meet strict guidelines for energy efficiency set by the U.S. Environmental Protection Agency (EPA). Before construction begins, your plans are analyzed by a third party government certified rater. We than take the recommendations given by the rater and carefully plan construction of your home to be the most efficient. As a result many of these homes are heated and cooled using less than 50% of the energy of a standard home. An Isaacson Home saves you money on utility bills, provide a more comfortable living environment with better indoor air quality, and helps protect the environment. Your savings in energy consumption could easily help offset some of the cost of your mortgage. Our homes are also available with a grid tie solar system. We work closely with the local power companies filing the necessary paper work in order to get the available rebates. Our systems can be installed on the ground, on the roof, or as a carport or porch. These systems can help minimize or eliminate your electric bill depending on the size and output of the system. Give us a call and we will help you plan the best course of action for your pending project. Isaacson Homes will do everything we can to make your home building experience enjoyable and your new home everything you dreamed it would be. In 2015, Buckingham Homes and Isaacson Homes began to collaborate to even bring you the maximum luxury experience.